9" wood rack style holder. 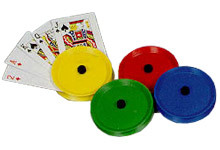 Set of 4 colorful, durable plastic disks. Holds all types and sizes of playing cards. 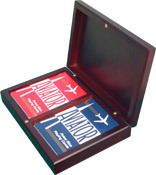 This set of two Plastic Playing Card Holders features two black card holders. The holders have a unique king's crown design molded into the plastic, and they can hold up to 15 playing cards each. 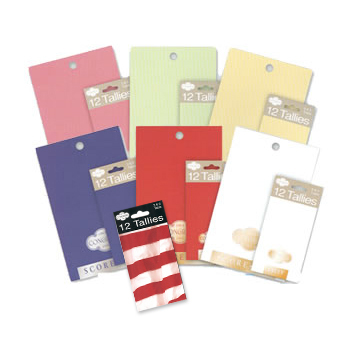 With their wide design, the Plastic Card Holders allow for easy card sorting and viewing. Each Holder can be hand held or stood up on a surface for hands-free use. This wooden storage box features a deep Mahogany-color stain and smooth finish. A magnetic locking mechanism keeps the box lid firmly shut. Holds two bridge or poker size decks. Handsome pecan color wood card box with hinged lid. Available with one- or two-deck capacity. Holds poker or bridge size decks. 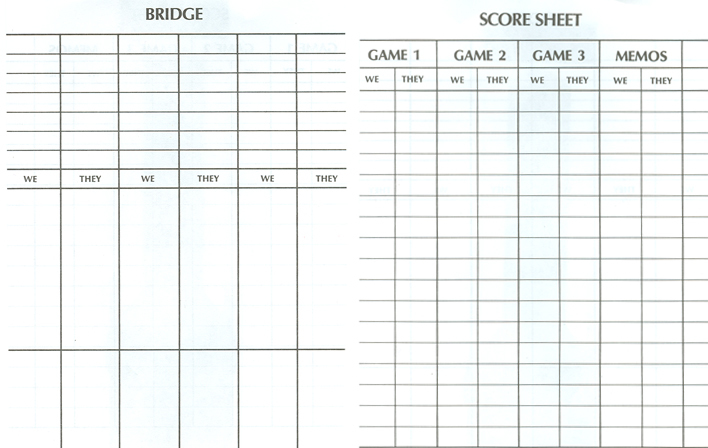 These Bridge Score Pads feature black print on white paper. Each pad measures 4 5/8" x 7 1/8" and has 50 scoring sheets. 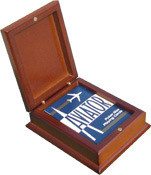 This Jumbo Bridge Score Pad comes with 150 double-sided, printed perforated pages measuring 5-1/8" wide x 8-1/2" high. Inside cover offers a quick reference for bridge scoring. Coordinate your next bridge game with these colored Bridge Score Pads and Tallies. Our Bridge Score Pads are available in Mint, Pink, Red, and White. Bridge Tallies are available in Mint, Butter, and Red. Patriotic/American Flag Bridge Tallies are also now available.